A while back I posted a news item for the Wrist ID Sport by Road ID, which displays emergency contact information for fitness enthusiasts. 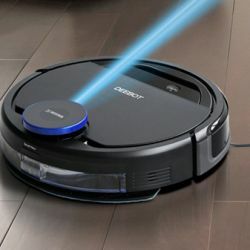 I thought it looked cool and was a great product idea. At the time, I had been doing quite a bit of outdoor running, so I ordered one and tried it out. As I mentioned above, back in summer 2010 I had been running outdoors almost every day, sometimes on a paved trail near my home, but mostly on country back roads over my lunch hour at work. Most of the roads were minimally traveled by motorized traffic, but a few were busier, with car, pickup truck and sometimes larger vehicles. Occasionally one would fail to slow down, or to slide over to give me some room, and every time that happened it made me think, “What if I got tagged by one of these near-misses?” On my person I carried my iPhone (which would be password locked) and my work ID badge (to get back into the building), but neither seemed sufficient in an emergency, especially if I wound up lying in a ditch or field alone and unconscious, or worse. I didn’t really want to carry my wallet or some emergency information card, and a MedicAlert-style bracelet wasn’t really my style. I wanted something that displayed information that would be vital for getting help to me in an emergency. 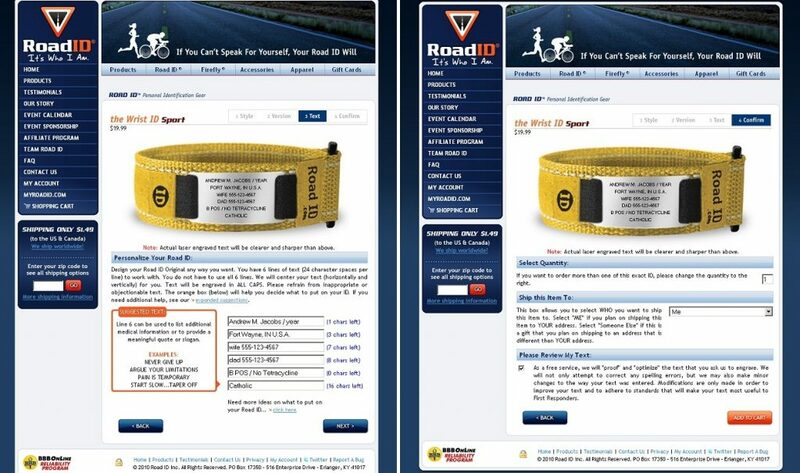 About a year prior, I’d seen a Road ID ad in a fitness magazine, so I checked out their website, then ordered their original Wrist ID Sport product. 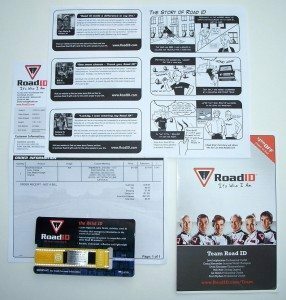 The Road ID web site, in addition to being the place where you order your Road ID product, also contains lots of other interesting information like an “our story” section, testimonials from users of Road ID products, an event calendar and sponsorship section. When ordering any of the ID products at the Road ID site, the process begins with “building your ID.” The site prompts you through a series of steps to choose the type, color and size of Road ID product you want, and gather information to personalize your Road ID. A cool thing here is that as you add or edit information that you want on your bracelet tag, it is displayed on the screen exactly the way it will look when you receive it. The shipping package is fairly straightforward, a simple bubble envelope. However, is it customized with Road ID branding on front and back and it is worth noting that the back of the envelope has a short explanation about why the company was founded. A nice touch. 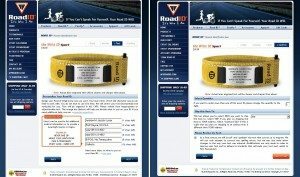 I ordered Road ID’s original product, the Wrist ID Sport, which is $19.99 plus shipping. I thought it was a pretty fair price when I ordered it, and this was confirmed once I’d received it. 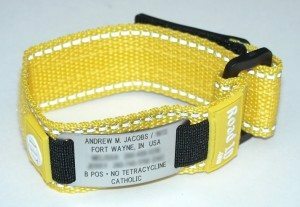 Its design is relatively simple: it is a bracelet with an identification plate and a velcro closure. It is available in three sizes: Small, Medium-Large and Extra-Large, so that you can find one that is closest to your wrist size and in black, blue, red, yellow, pink and purple colors. But I have to admit that I was bummed to not find it in green. I ordered a yellow with the idea that it would provide the highest level of visibility. The main band is a nylon material that is comfortable against the skin and washable in case you get it full of exercise funk. There are also two strips of 3M Scotchlite reflective material stitched into band to provide increased visibility in lower light situations. The stainless steel ID plate has a silver satin finish which hides smudges and reduces glare, and the lettering is laser-engraved so it is sharp and will not wear off. It has a curved shape so it fits the contour of the wearer’s wrist and is attached to the bracelet via a strip of elastic (see detail below). 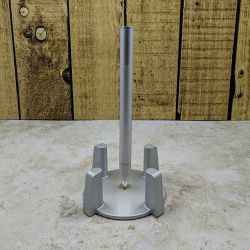 Because the ID plate is stainless steel and due to its thickness, it is quite resistant to bending or denting that might occur during normal use. 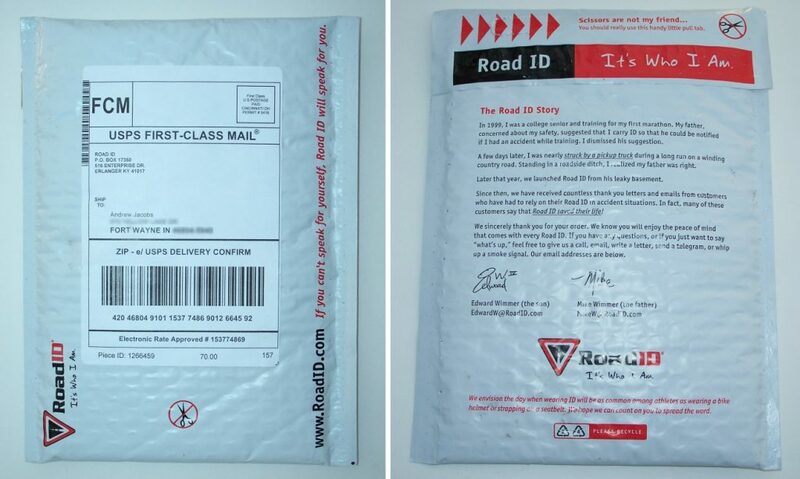 During the ordering process, the Road ID site gave recommendations for what information to include on the ID plate. I chose to have my full name, date of birth, city, state and country, my wife’s name and mobile number, my dad’s name and mobile number, my blood type, my drug allergy and that I am Catholic. Road ID logos are generously placed throughout the product. The fold-over velcro closure allows it to be adjusted to varying wrist sizes for comfort or wearer preference, and also features a rubber “tab” at the end. In the image below you can see how the ID plate is attached. It has two prongs on either end which hold onto a strip of elastic material. The ID plate is held in place securely, but can be removed easily if the wearer needs to swap ID plates should your information change (replacement plates can be ordered from Road ID). I ordered a Medium-Large sized Wrist ID Sport and it fits my wrist fine. I like that it can be adjusted slightly, which allows me to wear it more loosely or tightly depending on my activity or preference. I also noticed that as long as you don’t wear it sloppy loose, it will stay oriented on your wrist. Meaning that if you position it with the ID plate outward (or vice versa), it will generally stay put. I wore the Wrist ID Sport for about a month while exercising, mostly outdoor running. 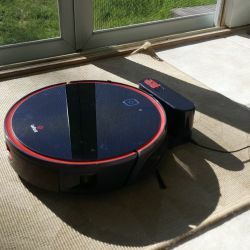 It performed well, was easy to use and felt quite comfortable on by wrist. I then wore it non-stop for a period of about two weeks and again it performed well. One drawback was that it absorbed quite a bit of water in the shower and took a while to dry. 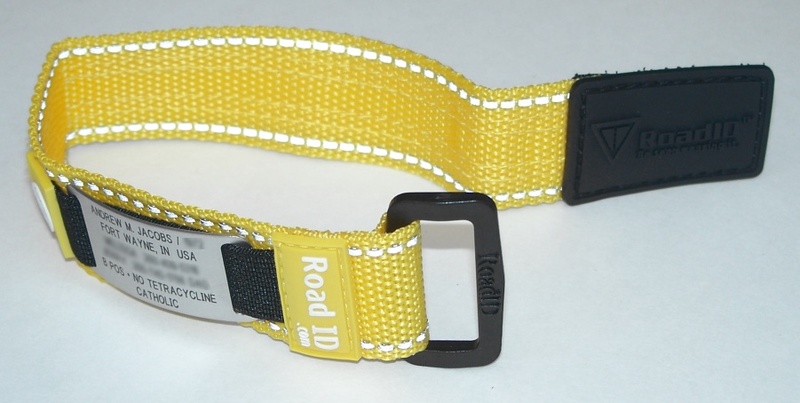 The idea behind Road ID’s products is to display important emergency contact information about the wearer to first responders in the event that the wearer is involved in an emergency situation. 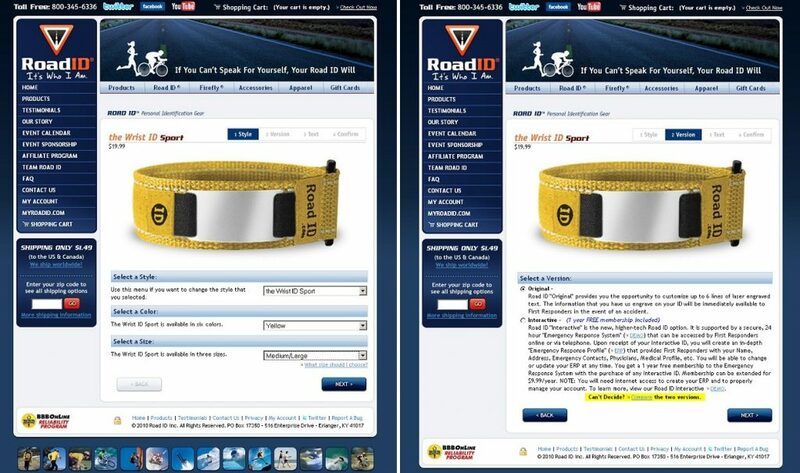 In this, it is similar to a MedicAlert bracelet or similar product, but where the MedicAlert products have more of a jewelry style overall, Road ID’s products have been designed for athletes and fitness enthusiasts, and their style reflects that. The Wrist ID Sport displays important information to emergency responders, is durable, easy to use, affordable and looks sporty. I have used and continue to use the Road ID Sport since I first ordered it. I use it whenever I go running or biking as an extra bit of insurance in case something happens to me. I think everyone ought to use a Road ID or similar product when they are exercising or doing anything physical outdoors. Source: The sample for this review was provided by Road ID. Please visit their site for more info. I do a lot of long rides on middle of nowhere B maintenance dirt roads; there’s not a lot of traffic but if something happens having emergency id is important. I ended up getting the wrist id elite (so I could get green!) and the band is pretty comfy- it’s a silicon material like the livestrong bracelets, and is segmented so you can resize it. 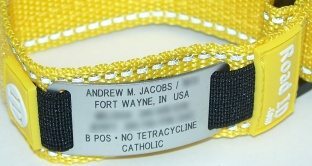 The id tag is a “C” section that just slides over it, and the clasp is similar to that of a metal watch band. Looks great, and sweat and water haven’t damaged anything yet. I’ve had these for my husband and me (the “dog tag” style) and our children (the “wrist” size fits their ankles perfectly!) for years. I’m amazed how my children wear them day in and day out and even ask to wear their “name tags”. 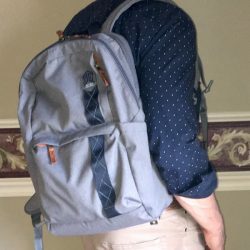 I originally bought them for trips and special events – my oldest is autistic and we need something for safety as he couldn’t talk til he was 4 – but they’ve ended up wearing them every day because they like them so much. I think my oldest may even have learned to spell his name from the id! 6 years of long wear on the a kids ankle, and it’s still in great condition, and they will replace it if it completely wears out. The best product, and you should think about them for kids, seniors, exercising, and even just for travelling! @Kevin – I wanted to start with the original Wrist ID Sport, but I like the style of the Wrist ID Elite, and I’d love to give it a try too. @Maria – That’s a great idea. I hadn’t even thought ‘outside the box’ of athletes and fitness freaks. I might have to think about that for my kids! I ended up getting the wrist id elite (so I could get green!) and the band is pretty comfy- it’s a silicon material like the livestrong bracelets, and is segmented so you can resize it. The id tag is a “C” section that just slides over it, and the clasp is similar to that of a metal watch band.That’s a great idea. I hadn’t even thought ‘outside the box’ of athletes and fitness freaks. I might have to think about that for my kids! I got one for cycling. Great service and remarkably cheap even with shipping to Australia. I like the idea of using them for kids. I got one because I cycle on some narrow roads that have occasional moderate to heavy traffic including large trucks, but as a musician as well, I travel those roads late at night. Now that winter is here there’s no telling what kind of weather I could be driving in. I could just as easily have an accident in my vehicle as on my bike. My RoadID will be now going to my performances as well. I’ve thought about getting one for my son and actually suggested to the company that they make a kids’ version. My one hesitation is that their name is easily displayed. Since we teach kids to avoid strangers I don’t want a stranger to be able to read the child’s name and parent information off the tag and act like they are a family friend. An ID with all of the information on the back would solve that. Hopefully they will adopt something like that. I think a lot of parents would go for one for their kids. 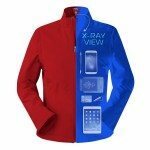 I bought one for wilderness horseback riding and I have put it through all types of weather and it looks brand new. I’ve never had the slightest rubbing from it, either – hardly knew it was there. Like some others here, I am considering other uses for it now. I passed out during two road races this summer from a medical condition that still has not been diagnosed. It was comforting to have my Road ID bracelet on. The paramedics knew immediately who I was and how to reach my family. 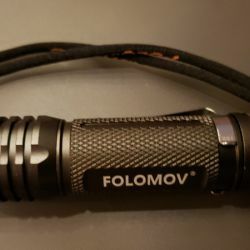 This is definitely a must for every outdoor enthusiast. I thought I would never need it and look how wrong I was. It’s peace of mind. I took up running earlier in the year, and started reading magazines such as “Runner’s World,” “Women’s Running,” and “Trail Runner”. I found ads for Road ID in each of these magazines, so I decided to check it out. I also started with Wrist ID Sport, which I intended to use during my training runs, gym workouts, and actual races. Eventually, I started wearing my Road ID daily–even for work and church, and any other activity that requires me to leave my house and brave the streets of San Francisco. 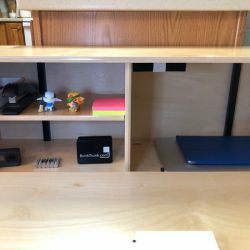 It’s comforting to know that, if the unthinkable should occur, EMT and/or medical personnel will be able to contact my family and access vital information in a timely manner. Over the years, I’ve had the Fixx ID, the original and the elite and all have been great. I like the elite in that personal, medical and contact information can be updated at any time. Also have the Fixx ID’s for the kids just in case. Gives me peace of mind when we’re out and if we were to get separated, our contact info is always with them. 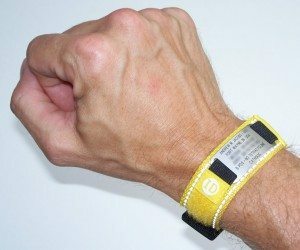 I previously owned a roadid and to be quite frank, it fell apart. 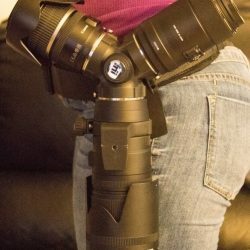 The buckle failed so I bought a SPORTSTAGID which looked similar but its 1000% better. I have worn this now for scuba diving climbing and cycling. 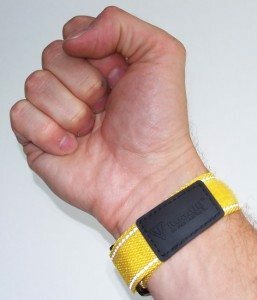 The Roadid cannot hold a candle to the Sportstagid. Better yet its made by Canadian eh so the price was lower and with the amercian dollar being stronger (barely) I got a nicer product at a better cost. Their service was prompt and reliable. Take a close look at Sportstagid. They dont make 10 different types, just one decent one that works. Worth checking out. 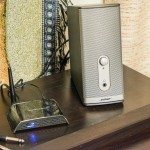 @Bob Mackenzie – Thanks for the feedback on a similar product. FYI, the SportsTagID product looks very similar to The Wrist ID Elite product by Road ID in both materials and design. A great upgrade to the Road ID is a newer product called UTag Ice. This is very similar in weight and construction to Road ID, only it holds a micro usb chip that will contain all of your personal ID, medical and contact information and instructions. I highly recommend it. http://www.ice-utag.com is the website. regarding your comment on roadid and sportstagid. The products may look similar but they are completely different. Roadid uses a rubber band material that is thinner and harder while Sportstagid uses their own type of silicone formula much softer and skin friendly. Their engraving is clearer and larger an their clasp is different as is their package, last they have tag less version they call naked id which is lighter and more comfortable. I suggest you look at both before making a stand back call. I like bob own both too and like bob says it really is much better….The sportstagid that is. and it costs less, hard to believe. Thanks for all of the suggestions of similar, alternate products, everyone. As a potential buyer, it’s good to have options. SportsTagID and Roadid are completely different products. Colours, bands, clasps and even the engraving. SportsTagid has larger offset font for easier reading, the band is softer, the packaging is a tube versus a mint style tin can that Roadid comes in. And SportsTagid cost less, they make bands for all sports not just cycling and running like roadid. Sportstagid is known as sports ids and its they also make medical sports ID and regular medical ID. Both companies are similar but there products are much different. 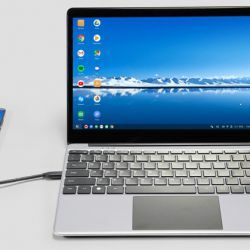 @B. Jones – It would be interesting to do a side-by-side comparison review in order to confirm the similarities and/or differences that you suggest. ABSOLUTLEY as life saver! I started getting these bracelets 5 years ago when my granddaughter was diagnosed with Type 1 Diabetes – it has all of her information on it and we are so thankful for ROAD ID! I recommend them to everyone!! @chris – Thanks for that feedback and additional idea for the use of a RoadID (or similar product). Just a quick update, a while back I purchased a pair of RoadID Scout ID products for my two dogs, and I have also recently purchased a RoadID Wrist ID Slim for myself. 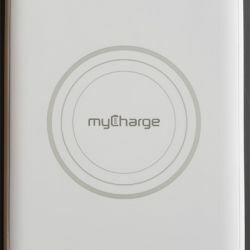 Stay tuned here at The Gadgeteer for reviews on both of those products in the future. @Sara – Good feedback, I can see where that might be the case with some really hard-core sports. I wonder if Road ID’s silicone versions might hold up any better in those situations? 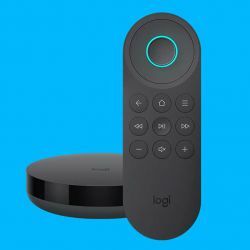 Great point about the lifetime warranty. 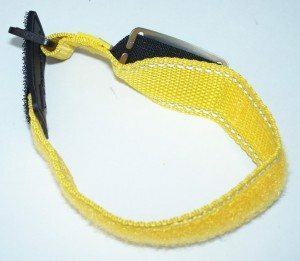 Have you had the strap/band fall apart on you, or was it the identification plate itself? Hands down I must say I just got my SportsTagID, put it beside the Roadid and its night and day. On the Sportstagid the engraving is brilliant, super dark, nicer stainless tag. The Roadid…like silver paint. The band on the Sportstag feels amazing….My Roadid…like hard rubber. Even the tube it came in is cool. For my $ I go SportsTagid. 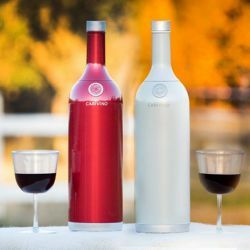 Its a better product and it even is a buck cheaper. Two thumbs up all the way.